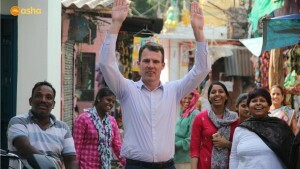 Our wonderful supporter, Mr. Chris Elstoft, Australian Deputy High Commissioner to India, who has been actively and wholeheartedly involved in Asha’s cause for many years now. 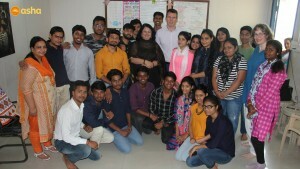 Mr. Elstoft has strengthened the 15-years long bonding and relationship between Australia in India and Asha by hosting two consecutive launches of our Internship Programme in the Australian High Commission. 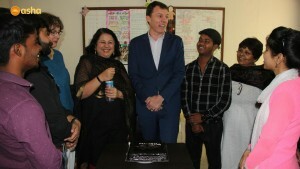 This programme gives an opportunity to our students from slums enter the professional world. As we bid farewell to Mr. Elstoft with a heavy heart at our Kanak Durga slum community on April 24, we made sure he spent some quality time with Asha Ambassadors, where he encouraged the students saying, "your situation shows you have determination. Your life experiences are very different because you face challenges every day. You have within you the urge to succeed. May you enjoy this journey and I wish you all the successes in your relationships and career." Dr. Kiran posing for a picture together with Mr. Chris Elstoft, Deputy High Commissioner, previous Internship Coordinator, Nadia Stuewer & Asha Ambassadors. 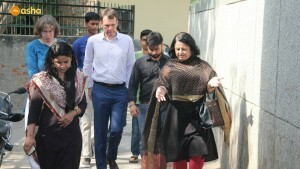 On behalf of Dr. Kiran Martin and the Asha team, we thank Mr. Chris Elstoft for his unconditional support and wish him the very best for his future. You will always stay close to our hearts and we hope that our relationship lasts a lifetime! 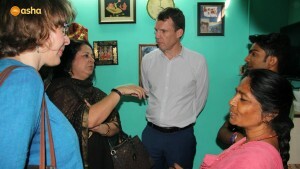 Inside the home of Asha Ambassador Ravinder.